Bridge keyboards and mice with classic hardware! The Wombat is a bidirectional ADB-to-USB and USB-to-ADB converter for keyboards and mice. No special software or drivers are needed – just plug it in and go. Now you can finally use a modern optical mouse with your vintage Macintosh, or amuse your coworkers with a retro ADB keyboard on your work machine. ADB-USB Wombat is an indispensable tool for Apple collectors and enthusiasts. ADB-USB Wombat comes fully assembled and tested. 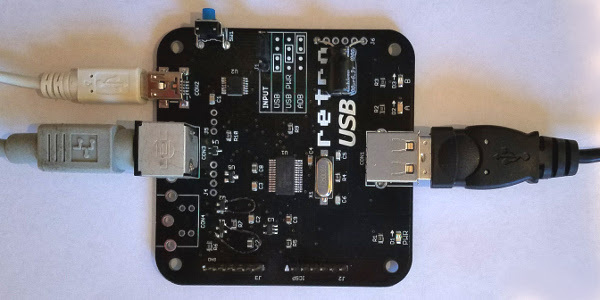 ADB-USB Wombat is great for breathing new life into your vintage Apple hardware collection. If you love old Macs, you know ADB keyboards are expensive and hard to find, and ADB mice are sticky and trouble-prone. With the Wombat, you can substitute modern USB input peripherals instead. Or if you swear by your old Apple Extended Keyboard, you can use it with your modern computer. Visitors are sure to smile when they see you running 1980s Apple input peripherals on your 2017 machine. The Wombat was developed by Steve Chamberlin, here at Big Mess o’ Wires. See the blog archive for technical details on its software and hardware. The Wombat hardware is compatible with all Apple computers, keyboards, and mice using a mini DIN 4-pin ADB connector, including most early Macintosh computers, the Apple IIgs, and some NeXT computer models. It is also compatible with standard USB keyboards and mice with a USB-A connector. When in ADB-to-USB conversion mode, it works under Windows, OSX, Linux, Chrome OS, or any other operating system that supports USB HID input peripherals. Security dongles, joysticks, and other less common devices are not supported. Connect USB keyboards and mice to a classic ADB-based Macintosh, Apple IIgs, or NeXT computer. Set the Wombat board’s jumpers to USB input mode, as shown on the diagram. Power will be supplied from the computer. Use an ADB cable to connect the board’s ADB port to the computer’s ADB port. A single USB peripheral can be connected directly to the Wombat board’s USB-A port at CON1, or a standard USB hub can be used to connect multiple peripherals at once. When in this mode, the Wombat supports one USB keyboard and one USB mouse, as well as any number of ADB keyboards and mice, all used simultaneously. Standard bus-powered USB hubs are recommended. Some externally powered USB hubs (with their own independent power supply) can backfeed power into the Wombat even when it’s off, causing problems. Most ADB mice had only one button, so the USB mouse’s right button is handled one of two ways. Macintosh mode sends a control + click event to the host, which opens context menus in Mac OS 8 and later. NeXT mode sends a true right click event to the host. Toggle between the modes by clicking the USB mouse wheel button (button 3). Power Key – Original ADB keyboards had a power key – a square or rectangular key with a triangle logo that could be used to turn on some later models of Macintosh computers. There’s an equivalent button on the Wombat board that will function as a substitute power key, even when the computer is off. Standby Power – When the Wombat is powered from an auxiliary source, it can continue working even when the computer is off. In this case, the PRINT SCREEN key or F13 key on a USB keyboard will also function as the power key to turn on the computer. To provide standby power, set the board’s jumpers to USB+PWR mode, as shown on the diagram (board version 1.1 or later only). Connect a standard USB charger to the board’s USB-B port at CON2. Connect ADB keyboards and mice to a modern USB-based computer. Set the Wombat board’s jumpers to ADB input mode, as shown on the diagram. Power will be supplied from the computer. Use a USB-A to USB-Mini-B cable to connect the board’s USB-B port at CON2 to the computer’s USB port. 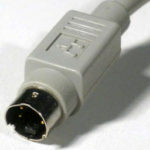 This is the same cable commonly used to connect mobile phones and other devices to a computer. In this mode, nothing should be connected to the Wombat board’s USB-A port at CON1. A single ADB peripheral can be connected directly to the Wombat board’s ADB port, or multiple peripherals can be daisy-chained, using the ADB pass-through connector found on all Apple ADB keyboards. 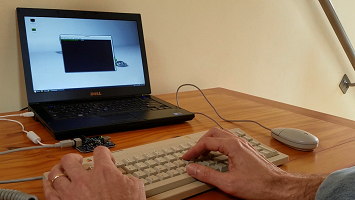 When in this mode, the Wombat supports one ADB keyboard and one ADB mouse, as well as any number of USB keyboards and mice, all used simultaneously. The ADB peripherals will appear as standard HID input devices to modern Windows, OSX, and Linux computers. No special drivers or other software are needed. The Wombat firmware can be updated to fix bugs and add new features. Download the firmware.hex file from the downloads section below, and copy the file to a USB flash drive. During the firmware update process, the Wombat board can be powered from an ADB-based computer and ADB cable attached at CON3, or from a standard USB charger and USB-B cable attached at CON2. If powering from an ADB cable, set the board’s jumpers to select USB-to-ADB mode. If powering from a USB-B cable, set the board’s jumpers to Standby Power mode (USB+PWR). Disconnect all power from the Wombat board. Plug the flash drive directly into the board’s USB-A port CON1 – do not use a hub. Hold the board’s power key button while you connect the power source to turn on the board. Continue to hold the button for a few seconds, until the A and B status LEDs begin blinking rapidly. The update process takes about 10 seconds. When finished, the LEDs will blink slowly together, once per second. The A and B LEDs on the Wombat board display status and error information. (The A LED is labeled RUN on some boards). During normal use, the A LED will turn on when the Wombat has a working data connection (ADB or USB) to the host computer. The B LED will blink whenever there’s keyboard or mouse activity. You can interact directly with the Wombat by typing help commands on an attached ADB or USB keyboard. Open an empty text document or command prompt on your computer. The Wombat will “type” its responses to your commands, so they appear on the screen. Control-Shift-Capslock-C – Enters keydump mode. While in this mode, the USB key code is displayed for each key that you press, along with the corresponding ADB key code it’s mapped to (or vice-versa). This can be helpful for troubleshooting key mapping problems. Control-D – Exits keydump mode. Non-US international keyboards are supported by the Wombat. 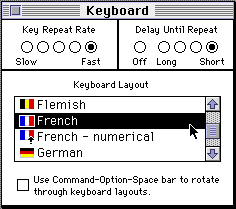 These include country-specific keyboard layouts like British, Canadian French, Danish, Greek, AZERTY variants, QWERTZ, and others. You’ll need to select the appropriate keyboard type in your operating system’s keyboard control panel, in order for the key mappings to work correctly. Two specific keys on ISO keyboards may require extra attention. If the key above TAB incorrectly behaves like the key to the right of LEFT SHIFT, you can switch ISO mode on/off to correct it. See details in the Help Commands section. USB-to-ADB – Best results are obtained with Apple-brand country-specific USB keyboards, or any brand US-layout USB keyboards. 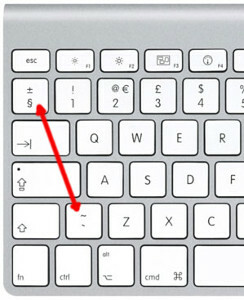 In many countries, the country-specific PC-type USB keyboards have a different symbol layout than Apple ADB keyboards. These PC-type USB keyboards may be used, but key mappings for some symbols will be incorrect where differences exist between the Apple and PC-type layouts. ADB-to-USB with Mac OSX – The first time you connect the Wombat to a modern Mac, a wizard will appear and attempt to detect the keyboard type. For non-US keyboards, you should select an ISO keyboard type from the wizard. If the key above TAB incorrectly behaves like the key to the right of LEFT SHIFT, even when the Wombat is in ISO mode, you may need to delete the OSX keyboard preferences to force the wizard to run again. Set the Wombat to ISO mode, delete the file /Library/Preferences/com.apple.keyboardtype.plist, restart the computer, and follow the wizard steps when it reappears. ADB-to-USB with Microsoft Windows – Under Windows, when using country-specific ADB keyboards, you’ll need to select an Apple keyboard sub-type when choosing the keyboard type in the Windows preferences. The keyboard type is selected in the Text Services and Input Languages control panel. E.g. 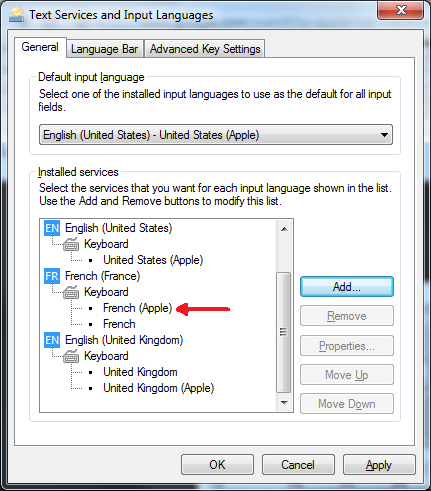 select a keyboard type of United Kingdom (Apple), French (Apple), or German (Apple) rather than the default United Kingdom, French, or German. If you don’t see the Apple sub-types listed, you’ll need to install the Apple keyboard driver applekeyboardinstaller64.exe. With firmware version 0.3.0 or later, you can create your own customized key mapping tables. Change which keys behave as Command and Option, reassign the function keys to new purposes, or design other custom mappings. See the Wombat Keymap Tool for details. What are ADB and USB? From 1986 through 1998, ADB (Apple Desktop Bus) was the standard system for connecting peripherals like keyboards and mice to Apple computers. It was used by the Apple IIgs, as well as all early Macintosh models except the Mac Plus, 512K, and 128K. The ADB connector is a round mini DIN 4-pin, and is physically identical to the S-Video connector. USB (Universal Serial Bus) is the dominant standard today for connecting keyboards, mice, and other peripherals to a computer. Nearly everyone will recognize the familiar rectangular USB-A connector that’s used to plug a device into a host machine. 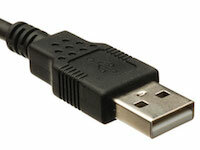 USB replaced a variety of earlier standards like Firewire, ADB, and PS/2. Every Apple computer since 1998 has used USB for its input peripherals. Converting between the two systems involves more than just a physical plug adapter. ADB and USB high-level protocols are fundamentally very different, and also have different signal speeds, signal formats, and voltages. ADB and USB input peripherals have different communication behaviors too. ADB keyboards and mice use event-based reporting, and only communicate when something has changed, whereas USB keyboards and mice communicate their full current state whenever asked. Check out ADB-USB Wombat at the BMOW Store. 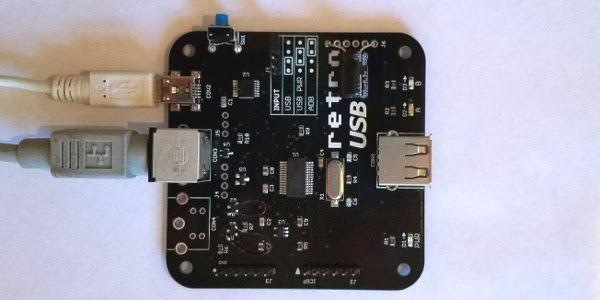 If Retro USB is out of stock, please check back again in a few days. I’m assembling more as needed. There was a bug with the @ and < keys on an AZERTY keyboard. Have you fixed it? Do you know if any bluetooth adapter could work so I’d have a adb machine with a Bluetooth keyboard? Firmware 0.1.8 adds ISO keyboard support, see https://www.bigmessowires.com/2017/05/31/retro-usb-firmware-update-0-1-8/ I haven’t been able to test it on a real ISO keyboard yet, can you let me know how it works for you? Please read the change notes for instructions for deleting your OSX keyboard preferences file, otherwise it may not work correctly. Wireless keyboards/mice from Dell and Logitech have been tested and work with Retro USB. I haven’t tried any bluetooth keyboards, but if you have one please let me know what you find. 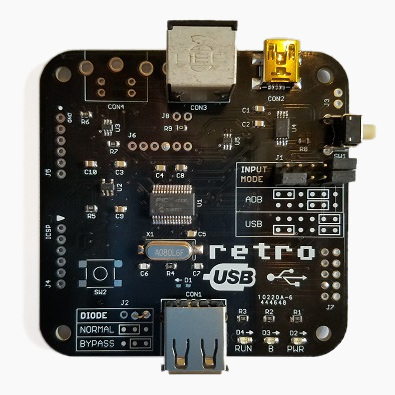 More Retro USB boards are now available for purchase. Bluetooth adapters generally will not work, unless the adapter just uses Bluetooth as the wireless mechanism but still present itself as a USB HID device (I don’t know of any such wireless keyboard or mouse that does that). I don’t think the Retro USB is a full USB host that can recognize Bluetooth adapters. Steve? There’s certainly nothing Bluetooth-specific in the Retro USB host code. It knows how to talk to USB HID input devices, and (in the bootloader) mass storage devices. Well I’d like to order one then and I’ll do some testing and report back here. Both azerty kb and bt adapters. How can I get one? It’s still not available in store. Would a PS2 over USB adapter work ? Some of the WIDComm bluetooth dongles will appear as a generic composite USB HID device on boot to allow use of the last paired keyboard/mouse before the OS boots. After the Bluetooth stack loads, it will send a magic keystroke to the HID device and the dongle will switch to being a complete Bluetooth receiver. Apple’s built in bluetooth interfaces did exactly this in Powerbooks. The store shows the current stock status, so if it’s sold out there, you’ll have to try again later. I don’t have a pre-order system, sorry. Eventually supply will catch up to demand. The hardware is designed for standard USB input devices, like the ubiquitous PC keyboard and mouse. For other devices like Bluetooth or PS2 with adapters, you’re in uncharted territory. If the device hides away those details internally, and presents a standard USB HID device interface to the host, then it might work. Try it and let me know what you find! 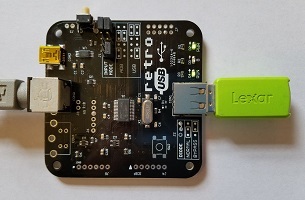 More Retro USB boards are now available in the store. These are version 1.1: same functionality, but fewer jumpers needed for setting the input mode. Thanks so much for putting the time and effort into this adapter. Finally got my hands on one. Your work is so unique, and incredibly useful/fun. 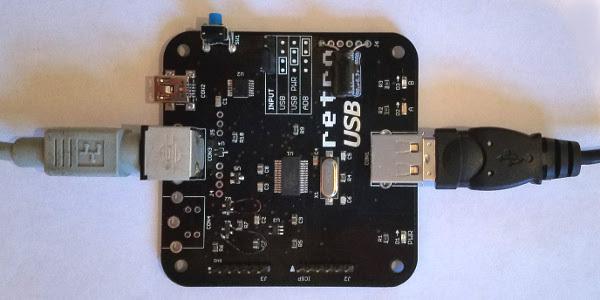 Another batch of Retro USB boards are now available for purchase. I think I’m almost caught up! Has the existing stock of boards been updated to 1.2? I was hoping to get one, and to hook it up to my Apple A1243 keyboard, if possible. Yes, v1.2 is shipping now for new orders. Just got my retro USB last week. Real dumb question, but others may ask as well: using this with a IIGS, how to emulate Open Apple-Control-Esc and Open Apple-Control-Reset? Figure I must be missing something obvious. Thanks for making awesome products for my beloved Apple IIs! They work great, just one more dumb question: 1) Which key is mapped to the Option key? If you have Windows-style keyboard, alt = option and windows key = command. It works the same as when using a Windows-style keyboard on a modern iMac or MacBook. I’m enjoying my USB Wombat greatly. Thanks for making this available! I’m loving the scroll wheel -> arrow keys mapping on the latest FW. First, a note: I’ve had mixed luck with PS2->USB adapters. I have an older PS2 KVM that I’m using along with the USB Wombat. On my 1.1 board (with the added capacitor, although that didn’t make a difference) 2 out of 4 USB->PS2 adapters I found worked, while the other two did not. The nonfunctional ones work fine on a PC, but on the Wombat board the mouse and keyboard receive power (apparently) but nothing comes through. I ordered a functioning one from Amazon with the name “SANOXY USB to PS/2 Adapter.” I would list the functioning USB IDs, but another adapter I ordered (quite different looking, I should add) has the same USB ID and strings but does not work. Second, a request: would it be possible to alter the mapping between Alt and Windows keys on a PC keyboard so that it feels like a Mac keyboard? Are you going PS2 -> KVM -> PS2 -> Adapter -> USB -> Wombat -> ADB -> Macintosh? Wow!! I hope to provide user-defined key remapping in the future, as other people have requested something similar. The current mapping for alt/windows matches Apple’s own USB keyboards, where “alt” and “option” are printed on the same key, and I’m following the standard they set. Yup, there’s also a USB -> PS2 adapter on the mouse before the KVM, but that’s just a pin adapter as far as I know. Thanks for the response and thanks again for the product. I am typing this on my Apple Extended Keyboard II, and the wombat works great! 1. Can we map the Power key on the ADB keyboard? Now that we have keymappings, it should be possible, but I don’t see it in the keymap generator page. 2. Is it possible to enable right modifier keys? Is it a hardware limitation or can it be enabled? https://archive.org/stream/Guide_to_the_Macintosh_Family_Hardware_Second_Edition#page/n347/mode/2up says you need to set a register to enable this. Both are theoretically possible, but not implemented due to technical difficulties. Do you have plans to support Macintosh JIS emulation? No JIS plans at the moment, sorry. Eventually I’d like to open the firmware, so other people could pursue additions that are a bit too niche for me to justify the time required to do it myself. Specific 3rd-party trackpads, gamepads, JIS devices, maybe NeXT-specific stuff, etc. Is it possible for the wombat to mount a usb flash drive using OS 9? Hello Steve! I want to give a huge “thank you!” for this magnificent piece of Hard-/Software! Finally a dream has come true: I can utilize optical mouses on my old Macs. I’m starting to put some money aside so I can get more of these for any Mac I own. 🙂 Again, thanks! Really! Thanks so much for creating this little device it is amazing! A digitizing pad probably won’t work, sorry. The Wombat can translate standard mouse and keyboard events from ADB to USB, but doesn’t know about other devices like tablets, joysticks, dongles, etc. Drats! Well another piece of ancient technology that’ll gather even more dust. But many thanks for your rapid and honest reply. Hi Steve. Would this connect an Apple Extended Keyboard M0115 to a PC with little to no issue? Yes, with the Wombat you could connect the AEK to any modern USB computer. Thanks to your magical Wombat, I am typing this on a completely cherry AEK II. It was owned by a film production studio in Hollywood. Someone splashed coffee on the lower right corner. This resulted in the Num-pad \’.\’ key becoming unresponsive and the \’Enter\’ key sticking. The incident must have occurred when it was relatively new because they put it back in the plastic bag it shipped in and stuck it in a storage closet in the original cardboard box. After all this, it sat marked \”SURPLUS\” for an emergency, I guess, for like 20-26 years. I was able to completely disassemble it, washed the coffee off the keys with some sudsy dawn and disassembled the two ALPS switches, cleaning the guts. The end result of all this was a cosmetically perfect, un-yellowed AEK II. There is not a stain or mark on this thing and it now works absolutely perfectly. The cream ALPS switches feel crisp and new! Thank you! Typing on this takes me back to my second Mac, a IIci, back in 1990. Got my wireless keyboard with built in trackpad working on my IIgs! Trackpad is a bit slow on the Logitech K400 I tried so I’m going to test some other keyboards as well to see if there is any difference. Thank you! Would this work with ADB joysticks such as the Gravis MouseStick II? Nope, sorry – it’s designed for keyboards and mice. See some of the comments above yours for more discussion of this. I have a question. I would like to hook up a keyboard from a Macintosh II Classic to this device and then run the USB cable to a raspberry pi 3 I just wanted to know if this is doable or not? Thank you for your time. You might need to use a powered USB hub with the RPi, because I think it can’t source as much current to USB devices as a normal computer can. Other than that it should work. Okay that’s no problem at all 🙂 I looked at some other options this one looks the easiest and it looks the cleanest too. You really made my day. I’ll be placing an order in a few weeks. And I’ve shown my cousin your site and he’s likes some of your products for his old Mac equipment too! Thanks. Can not get the Wombat to work fully in the ADB to USB mode. Mouse pointer moves and selects.Keyboard has no response other than B light on Wombat flashing twice on keystroke. Any suggestions? I’ve got a rev 1.0 ‘Wombat’ and it seems a little flakey. I’ve updated its firmware to the latest and sometimes it just decides to crash; the light that usually flickers when USB input is detected just stops. Unplugging my USB hub and waiting for a few seconds before reconnecting it gets it going again. The weird thing is sometimes it’s really “crash happy” and others it’s rock solid for quite a while. Any ideas on getting it stable (tried different hubs, peripherals and such) or modifications that are required? Please use the “contact” link at upper-right for support email, if you have specific customer support issues. The web page comments aren’t monitored regularly and are more intended for general-interest feature-related inquiries. @Al Unfortunately I’m not sure what more to suggest. If this is with your OS 9 machine, maybe it’s an OS configuration issue there? The hardware is covered by a 1-year warranty – use the contact link to get in touch if you suspect a hardware problem and want to do a product return. @Sarah could be power glitches, you might try running with a standby 5V power supply connected to CON2, if your ADB power supply is questionable. Hi! 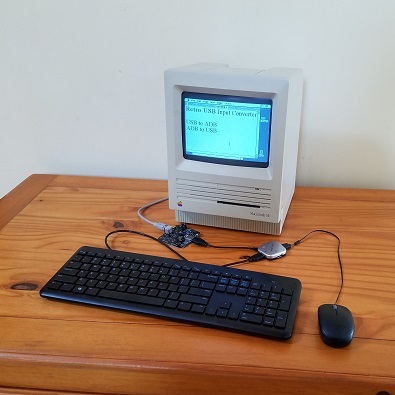 I have an old Power Macintosh G3 Tower and keyboard that work well on Mac O.S. 8.6– but the ADB Mouse no longer does. The trackballs (I have three ADB mice and switch them out frequently now) stick, even with daily cleaning of the inner wheels and mousepads. So I’d like to connect an optical USB mouse (like the Macally ICEMini I use on my MacMini) to the G3 so that I can continue to operate the vintage versions of PageMaker 6, Poser 4, and Photoshop 5 that I use for personal creative projects. I’m willing to purchase the Wombat, case, and spare ADB cable if that setup will work. Please– PLEASE– reply and let me know if this is solution I need or if you know of another. Respectfully, Peter (Dr Zik). Yes, that’s handled by the USB-to-ADB feature described above. Check out the video for a demonstration. You don’t necessarily need the case or cable accessories, but they make it more convenient to use the Wombat. The current lot of boards has 0.2.2 pre-installed. If you want the key remapping feature that was added in 0.3.0, you can update using the “Firmware Updates” process above. Is there a way to increase the speed of the mouse movement in the Wombat? I using an Apple Desktop Bus Mouse II hooked up to my 2008 Mac Pro through an Apple Extended Keyboard and even though I have the Tracking Speed set to Fast (maximum) in the Mouse System Preferences it is still pretty slow. With my Magic Mouse I can move across the full width and height of two side by side monitors (30″ and 24″) without ever lifting my hand or the mouse off of the table, just extending my fingers. Thanks. Mouse speed is adjusted through the operating system of whatever computer the Wombat is connected to. There’s no way to modify the speed on the Wombat hardware, sorry. The issue was that I had both both mice connected at the same time and while the Mouse Preferences panel (which was customized for the Magic Mouse and all of its capabilities) settings affected the ADB mouse it seemed to use the same parameters (acceleration scaling, etc.) for the Magic Mouse for both mice. When I disconnected the mice and then plugged in just the ADB mouse the Mouse Preferences panel became very basic and the settings were then appropriate for the ADB mouse. The ADB mouse now works as expected. Posting this follow up in case anyone else has the same confusion. I noticed an unusual issue. When I start my 2008 Mac Pro with the Wombat connected to a USB port, the CD tray ejects and the startup screen gives the “Prohibitory Symbol” (circle with slash through it) which, according to https://support.apple.com/en-us/HT204156 means that it can’t find a System Folder to boot from. My guess is that it thinks the Wombat is a USB thumb drive that I might be trying to boot from. If I unplug the Wombat it boots normally. Same thing happens whether I have a keyboard and/or mouse connected to the Wombat or not. @Sean Manning, I have the same issue with my Mac Pro 2008. It also ejects the DVD tray but it has been doing that since I replaced the original DVD drive, so it is probably not connected. @Sean Manning, just to clarify; I am also having the same boot issue with the Wombat and my Mac Pro 2008. In case that wasn\’t clear in my original post. Will the Wombat work with a Wireless Keyboard/Trackpad Combo like the Logitech K400r for instance? Wireless keyboards and mice are OK so long as they aren’t Bluetooth. So this won’t work on a Mac Plus? I was about to get it to use in the printer port… it looks like an ADB port 🙁 I hate the plus keyboard!!!! 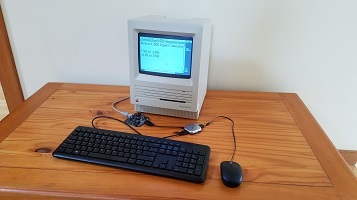 The Mac Plus is not ADB – it uses a totally different type of keyboard and mouse shared with the Mac 128K and 512K. We are looking for an adapter to connect current USB devices (keyboard, trackball) via a KVM extender to an AT keyboard input on a legacy system. • Is ADB the same as PS/2? • Can your WOMBAT also function on an AT-keyboard input? • If not, do you have such a device? I am looking forward to your (quick) reply. No, sorry. AT and PS/2 keyboards were used with 1980’s IBM computers. ADB is a completely different standard for 1980’s and 1990’s Apple keyboards and mice. As soon as I saw this, I couldn’t order it fast enough. ADB keyboards and mice are hard to find, and this will give me tons of options for what to use with my SE. Is there any kind of noticeable lag with keystrokes or mouse action by using the Wombat as a signal converter? I assume not but wanted to check. There’s no perceptible delay – you can watch the videos for an example. If you measured it very accurately, the delay is probably in the 10-20 milliseconds range. I have my Wombat and my AEK battleship running smoothly. Even have media keys mapped to function keys via Keyboard Maestro. Great product! I’m confused about the Power key, however. The description above implies that either (a) the power key on the keyboard works or (b) the blue button on the Wombat works as a substitute. I have the Wombat in ADB mode, plugged into my AEK at Con3 and the iMac at Con2. Con1 is empty. Pressing the blue button does nothing. Am I missing something? The power key is for early ADB-equipped Macs like the Mac II series or Power Macs. It’s a true switch that makes an electrical connection to turn on the computer, rather than being a normal keyboard key. For the Wombat, it’s only relevant when in USB-to-ADB translation mode. USB-equipped Macs like the iMac don’t work this way and the physical power key isn’t used. Ah. Shame, that. But, hey. Cheers for the explanation! Using a Wombat with an Apple IIgs and a USB keyboard. I don’t seem to be able to get Control – apple – reset to reboot the computer. Control reset works (using the printscreen key as reset). But combining Control – WIndows – Reset seems to only send a plain reset (no forced warm boot). For giggles tried Control – Win – TheButtonOnTheWombat- same result. Anything I could be doing wrong? Send me a direct mail (see Contact at the page’s upper-right) and I can help you troubleshoot. The three finger salute also requires holding down all three keys for a longer moment than normal keypresses. Is there any reason why a Unicomp SpaceSaver M keyboard wouldn’t work with this? I’d love to hook up a “modern” USB keyboard and mouse to my IIgs. I’m not familiar with that keyboard, sorry. If it’s a standard USB keyboard and not bluetooth or otherwise exotic, then it should work fine. Here’s the keyboard: http://www.pckeyboard.com/page/FeaturedProducts/UB4ZPHA They don’t list power draw, but I know the old Model M the Unicomps descend from drew more current than average. Is it possible to use an ADB keyboard on an iMac (Rev a-D) running Mac OS 8-8.5? If so how? I have a Wombat but it show no activity? Try updating to firmware 0.3.1, it has a fix for USB keyboard emulation under Mac OS 8 and 9. Its posible to make the power key on ADB keyboards usable in modern PCs? I mean, can be the wombat modified to interpret the ADB power on key signal and drive it a pin header connected to the power switch header in a motherboard? I just received it for my Apple IIgs. fantastic product! I love it. Is there anyway to set this device to ‘Caps lock’ On when it powered on ? This devide is just perfect except this one. Has anybody tested this specifically with the Dvorak keyboard layout? How about Electric Dvorak on System 6? Great Product, using the Wombat 1.2.3 to type this comment from IIGS ADB keyboard. Keep up the good work. Enjoy reading your blogs, good technical descriptions. The fixes from firmware 0.3.1 targeted at Mac OS 9 seem to have positively impacted powermacs in general. The few minor issues I had during boot sequence do not show up anymore with adb->usb emulation. Boot keys do work! Thank you for this project, Mr. Steve.